I have always been fascinated by the 'Puliyodharai prasadam' served in Perumal temples. Adding black pepper powder gives an exotic flavour to the temple puliyodharai. Earlier, the tradition of prasadam offered to devotees at temples, has always been viewed as a divine blessing and we would get it in limited portions. Nowadays, we can have the prasadam as indulgence, buy and eat from the stalls in the temple, not direct from the Madapalli though. There is not much difference in the method, but the cooking technique and spices and the preparation with great care to offer to the Lord makes the difference. The cooking technique in 'Madapalli' (temple kitchen) is always traditional and made in a big old fashioned stove called 'kottai aduppu'. Only specific utensils and specific spices are used. There would be a very big, stone slab to spread the rice and mix the puliyodharai. 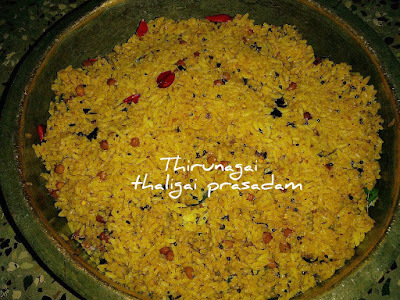 Thirunagai puliyodharai prasadam is said to be best. Also puliyodharai prasadam in Tiruvallikeni, Ahobila mutt and Andavan ashramam will taste divine. Check out other puliyogare recipes posted by me. Chenna dal - 1 tsp. Soak tamarind in lukewarm water, extract thick pulp and keep aside. Powder black pepper and keep aside. (Black pepper can also be dry roasted until hot and powdered). 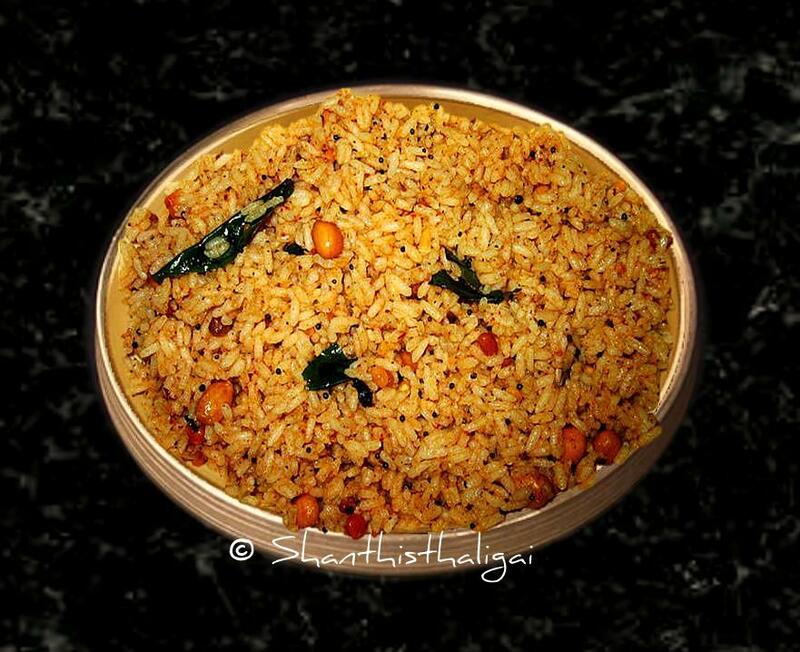 In a heavy bottomed pan, heat gingelly oil, temper with the ingredients mentioned in "for pulikkachal", one by one in order. When they turn golden brown, add the tamarind pulp. When it comes to rolling boil, add turmeric powder, hing, salt and stir frequently until it becomes like a paste. This is pulikkachal. This can be made in large quantities and stored for more than 2 to 3 months if prepared perfect. Cook rice in such a way that the grains are separate and not sticky. Spread the cooked rice in a plate, add little gingelly oil and allow it to cool. When cool, add pulikkachal to the cooked rice, according to requirement and powdered black pepper(to suit your tastebuds) and gingelly oil. Mix gently without breaking the grains. Kovil puliyodharai /Temple style puliyodharai is ready. Only raw rice (pachcharisi) is used in temples. The cooked rice should not be mushy. The grains should be separate without sticking. Mix rice gently without any lumps. Thank you Very much for posting this! Looks delicious. I will try it at home.